The Basha Tennis programs at Forest Crest and Lynndale Park focus on coaching children and adults to reach their goals as tennis players. 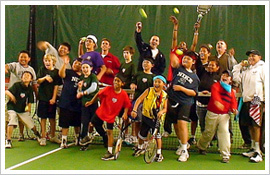 While competitive tennis is our specialty, we are proponents of playing tennis for the health of it. Our commitment to players training with us is to provide the most current technical and tactical training utilized with the safest methods of coaching. Our coaching staff regularly attends continuing education seminars provided by the United States Professional Tennis Association and the Sanchez-Casal Tennis Academy. Basha Tennis programs provide qualified coaches with pre-planned lesson plans and a player coach ratio of no more than 6 players to 1 coach. 3 players must be registered for a session to be hosted. We strive to provide the safest lessons possible. The 3 most common injuries in tennis are stepping on a ball, getting hit by a ball, or getting hit by a racket. We regularly remind players to be careful and aware of their surroundings. We ask that parents and children not participating in the training watch from off the court. Parents and players registering for our training sessions understand that while we keep a diligent watch on the players, tennis is a physical sport and sometimes injuries occur. We regularly remind players to be aware of their surroundings (other players, balls, carts, fences, light poles, walls, ball machine, and benches). All registrations should be made through our online registration system at www.forestcrest.com. Players must be registered with payment received before they participate in our training. Registration is on a first come first serve basis; if a player accidentally registers for the wrong training session they will receive a 100% credit but we cannot ensure availability for the appropriate level training session. Players withdrawing before 48 hours from the start date of a session will receive a 90% refund, players withdrawing within 48 hours from the start date (or later) of a training session will receive a 50% refund, there will be no refunds after the 2nd week of training. Players may join a session late but the registration fee remains the same. If a player would like to schedule a 30 minute evaluation lesson please contact any of our coaches. The evaluation cost is $30 for members, $35 for non-members. Please arrive 5-10 minutes early to maximize the time on the court. The first thing we do in every training session is stretch; players arriving late must stretch before they can join training. This is not a punishment; it is to help prevent injuries. Parents may watch lessons but they cannot be on the court during training and should not be involved in the training in any way. It is important for participants to be properly prepared to play tennis. Participants must wear close toed athletic shoes. Players wearing incorrect shoes will not be able to participate due to safety concerns, however they may sit on the sidelines to watch/listen to the lesson. It is important that players wear athletic clothing that will allow them to move comfortably on the court. During the winter months the courts will be a little cooler and during the summer months the courts will be a little warmer. Photographs may be taken during classes to be used in Basha Tennis promotional materials. Coaches are happy to teach private lessons. July & August at Forest Crest: All of our training sessions for juniors are offered in 1 week sessions or 4-week sessions. We do not provide make-up options for missed clinics during July and August. ​Lynndale Park Programs ​The Lynndale Park Programs are offered in 4-week sessions. We do not provide make-up options for missed clinics in the Lynndale Park Programs.